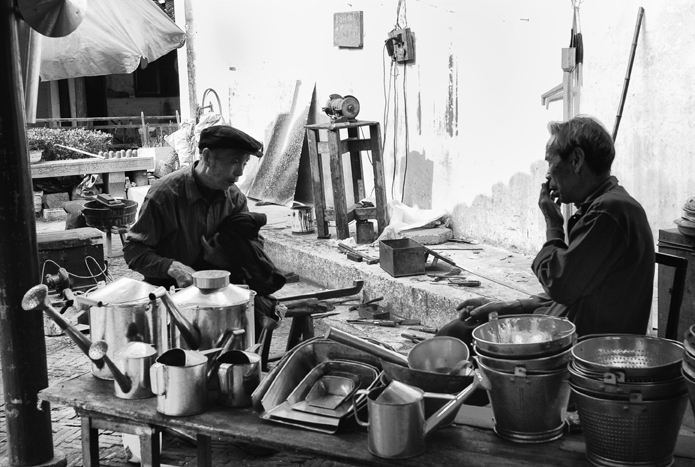 This image was taken in Wuzhen a small water town not far from Shanghai, the two men in the image worked in their small makeshift outside workshop with just an awning covering them and protecting them from the heat of the sun or from the rains, the quality of their work was incredible, all items you can see are hand made from more simple dust pans to elaborate watering cans and water buckets. I love to see real craftsmen at work and I could watch them create their masterpieces for hours on end…What do you think? I’d buy one of each of the large and small watering cans on the left. They have style! You’ve captured that look that merchants get when they’re bored waiting….Liked. I too, like watching craftsmen and at this point in my China experience am past buying fake merchandise. It makes much more sense to make sure that the quality is good and supporting someone’s real livelihood. Beautiful photos.